Hotel Des Puig Deia, Hotel Spain. Limited Time Offer! Hotel Des Puig. "Hotel Des Puig" is a hotel that has acquired 3 stars. The hotel can be found in Deia. To help visitors get around in the surrounding area easily, there is a shuttle service. The accommodation has 9 rooms. Thanks to the air conditioning, you will always find a comfortable room temperature inside. Enjoy some air in the privacy of the garden. You can take a swim since this residence offers its guests the luxury of a swimming pool. At this hotel, you can participate in tennis. The sports facilities include a tennis court as well as a bicycle rental service. This residence offers relaxing massages. You can end a busy day with a drink at the hotel's lounge bar. After a good night's sleep, breakfast is available. Of course, access to the Internet is available free of charge. 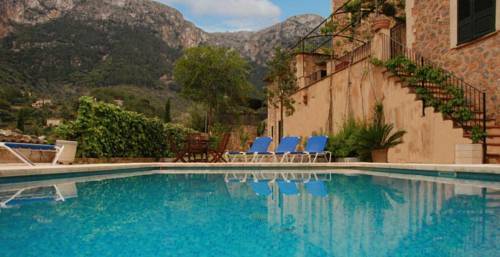 The Hotel Des Puig is located in Deià, a spot long popular with artists for its tranquillity. It has a swimming pool, fine views and free Wi-Fi. The rooms are decorated in a rustic style with traditional furniture.